My name is Meaghan Sanders. I live in Frankfort, Maine on a farm. I love my farm because of all the animals. 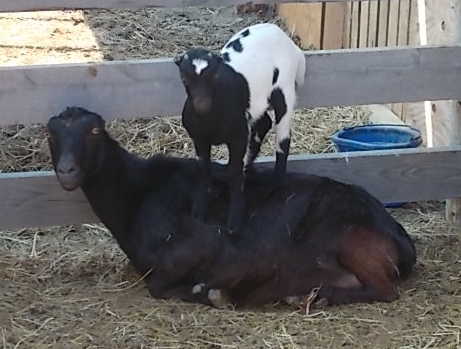 When I see the little babies head-butting each other, it makes me feel like I am one of them; like I am a baby goat. This morning, I had to feed and water the chickens, the goats, and my horse. My Mom will help. It's pretty easy. I am a farm girl. 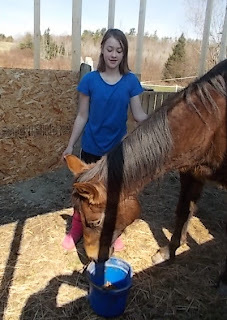 This is what I had to do: I had to give my horse 2 scoops of grain in her blue bucket. She decided she wanted to squish my finger. I was holding her bucket and she put her head into it, which is kind of big, for a horse. I didn't hold the bucket for long; I put it down and jumped on her back, instead! Then, we gave the goats 5 scoops of grain in the wooden trough for Jedi, Leah, Rachel, and Pepper. 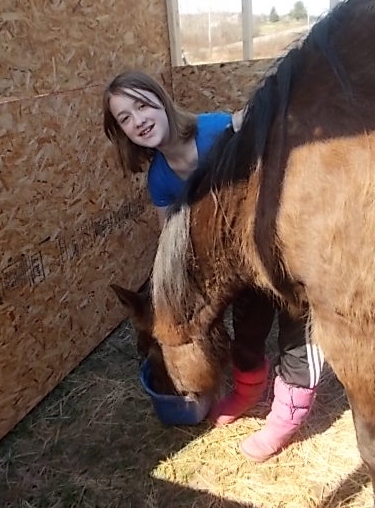 In the black bucket, Ellie and her babies get 2 scoops of grain. The grain is part dairy goat pellets and part sweet feed. 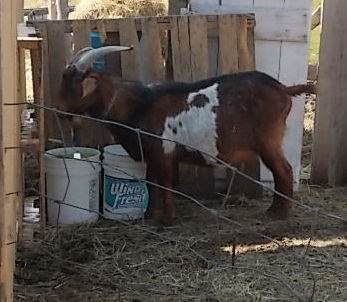 I turned on the hose and Mom filled 2 big buckets with water for the goats and then, filled the large blue water barrel for Jasmine. Next, we gave the chickens 4 scoops of cracked corn and layer mash, mixed together. We fed them 1 scoop in a bowl in the yard and 3 scoops in the feeder in their coop. I checked for eggs. This morning, I found 4 duck eggs in the coop. One fuzzy foot chicken was still in her nest box, so I let her sit there and didn't take any chicken eggs. I rinsed the red base of the chicken water jug while Mom cleaned the inside. It holds 7 gallons of water, so we put it back on the brick in the yard before we filled it with clean water for the chickens. It is too heavy to carry! Then, Mom fed the pigs 2 scoops of grain in their feeder and filled their water tub. I picked out 2 duck eggs from the top of the clutch of eggs in the nest. Mom and I brought them inside to the bathroom. We turned out all the lights and checked the eggs with a flashlight. Mom held the flashlight behind the egg to shine the light on the egg to see if it was fertilized. Unfortunately, so far, it seems not. We put the eggs back into the nest because we didn't know for sure if it was fertilized or not. We will check again in 2 weeks. After I put the eggs back, I chased Buster, who wanted to play with a friend next door; the neighbor's German Shepherd! I caught him and brought him inside. As soon as I brought him inside, Buster ran into the living room and laid down. He was tired out! Asher was standing on his mother's back! Hi, Miss Meaghan, such a good writer you are, you must have inherited that from your Mom! Fuzzy footed chickens are my all time favorite! Thanks for sharing your morning with us. You do such a good job! I love the picture of Ellie with Asher on her back. She looks like she is saying, "Look at the shenanigans I have to put up with!" Hi, Meaghan. I agree with Kim--you are a fine writer. I thoroughy enjoyed your letter about being a farm girl. It's a lot of work, isn't it, but you seem to be doing a good job. See you soon!